Today I'm back with Part 2 of Book Promotion: 20 Strategies That Will Broaden Your Reach. To check out Part 1, if you missed it, click on the link: Book Promotion 20 Strategies Part 1. 11. Give free or very reasonably priced workshops. Again, this is a proven strategy to increase your subscriber list with people who are interested in your topic. 12. Create a how-to-course and offer it in daily or weekly segments through emails. You will easily boost your subscriber list through a course. It also guarantees that those who subscribe for it will open your mailings. 13. Have a 2 for 1 sale and promote the sale through all your social networks and a press release. Everyone loves a sale. 14. Create and publish press releases on a regular basis. You can report on your teleseminars, how-to-courses, workshops, news, sales, etc. 15. You can also look into associations, businesses, groups, schools, and other avenues that may be interested in your book. This is also a great way to sell in bulk. 16. Sell through cataloges. This may take a bit of research, but the benefits may be more than worth the effort. Do an online search for ‘your genre’ book catalogues. 17. Become a part of joint ventures. 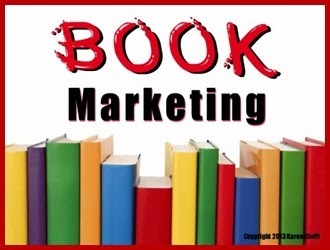 Publicists may be looking for authors to be partners in their book promotions. You help promote their authors’ books, and you’re listed in their content, usually by offering a free book, or e-book. There are different situations also. Again, this can be worth the effort. 18. Think about having your book included in book clubs. Again, do an online search. 19. Look locally. If you’ve written a children’s book see if your local toy store, baby store, or children’s clothing store will be willing to offer your book for a percentage of the selling price. If you’ve written a cook book, talk to the local bakery owner or coffee shop. And, don’t forget doctor’s offices, dentist’s offices, beauty salons, and so on. Don’t be afraid to seek out facilities that may not be an exact match. Establishing this type of partnership is a win-win situation. 20. If you have the funds, find out what a publicist or professional book marketer can do for you. Remember: nothing ventured, nothing gained. These are all great tips that I'll delve into, especially free workshops and how-to courses. I taught online courses for a small night school offering certificates in Project Management. Thanks for the ideas! Stephen, I'm glad listening to all those marketing teleseminars can help others. Fabulous tips, Karen. I've been approched about partnering in the past, but haven't taken advantage of it yet. I just haven't had much to offer in the way of freebies. I guess I could use Little Shepherd now, but I would really like to offer something new. A simple and no-cost gift is an ebook. I'm actually giving a free workshop next month on creating an ebook and what you can do with them. I've participated in a few JVs and my offer is an ebook on writing and/or marketing. But, a fiction book or ebook is a great offer also.